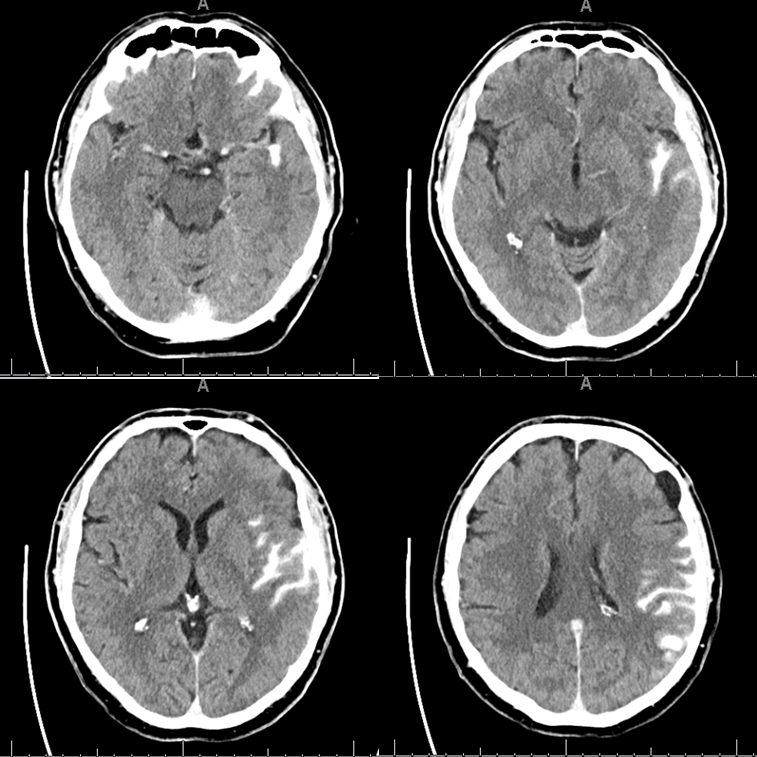 So much about stroke is who can do it faster, bigger, longer… Even so, it is still worthwhile to show this kind of case. 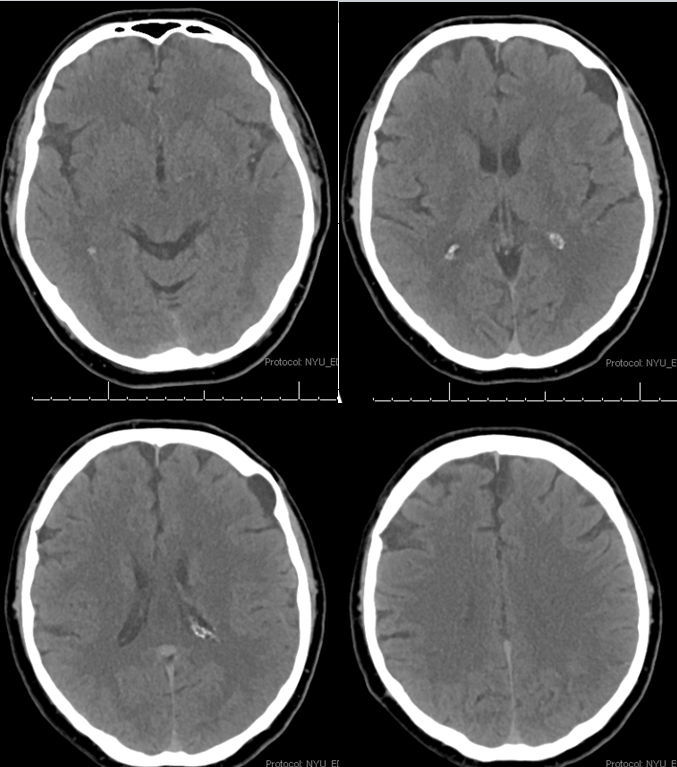 There are learning points and, as usual, stroke cases offer something for everyone. Here is an Olea Map. Red is dead brain, yellow is penumbra. If you are wondering how on Earth Olea came up with this curious map, so am I. 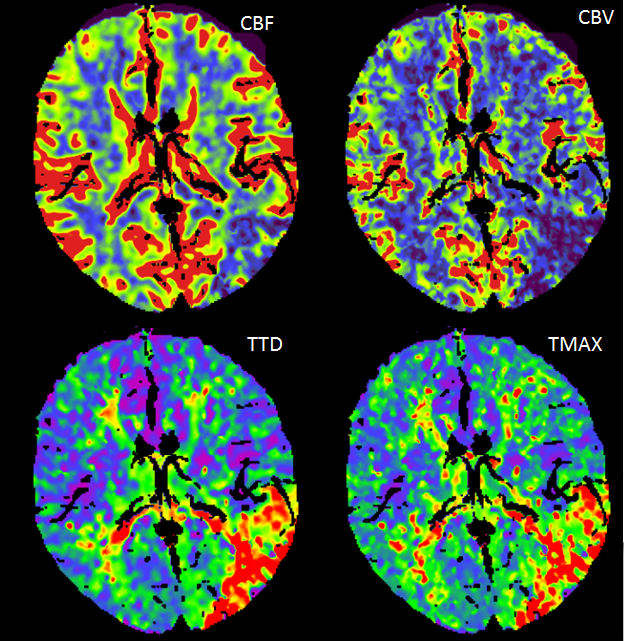 Pretty much every Olea map is premium fodder for those who advocate against perfusion. The one place where we would expect dead brain is marked as penumbra, while there are apparently several islands of irreversible damage in the frontal lobe. Many times Olea would mark eyes, skin, and ventricles as dead brain. This time, irreversible damage is limited to the small left frontal arachnoid cyst. However, the maps just above actually do make sense. There is very little penumbra, however it is in the Wernicke area, so we go for it. 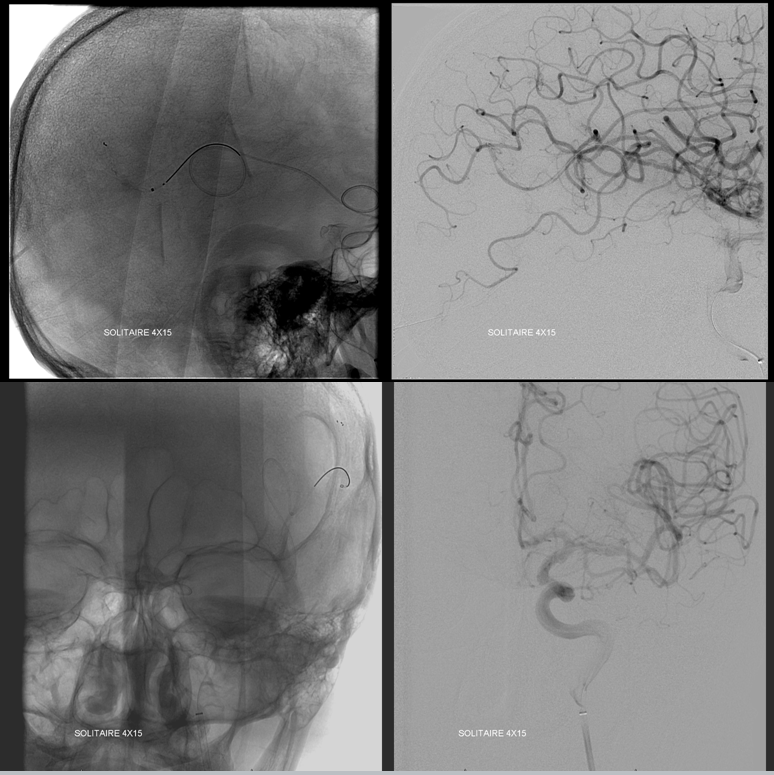 Angio shows expected angular branch occlusion, with poor leptomeningeal collaterals. Should we try to open it? I think the answer is yes, based on both CT and penumbra appearance. As of 2017 we do not have good evidence for what to do here, yet a broad consensus among stroke neurologists and interventionalists at our institution supports aggressive measures to get this done. 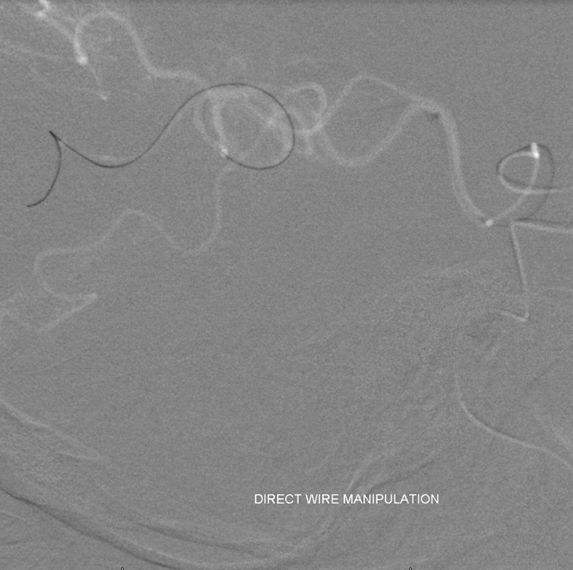 A Synchro 2 wire is used to macerate the clot. We brought up an Echelon catheter to enable intra-arterial thrombolysis. 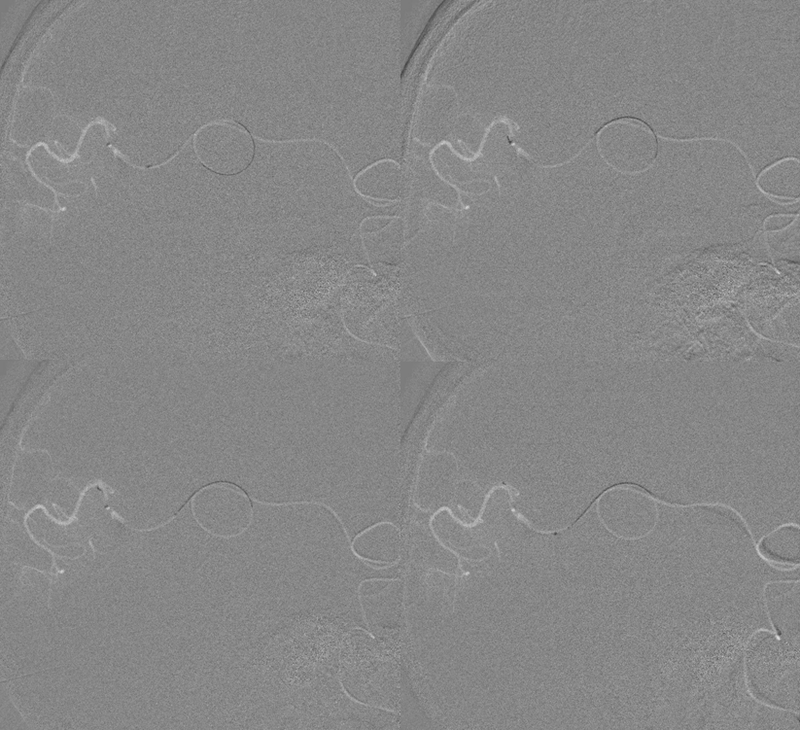 We felt this was too distal for mechanical thrombectomy as a first line. Very rarely do we give IA lysis but this was one of the cases. The Echelon is long enough to get distal. The clot is rather short. IA tPA and Reopro are given (4 mg each) with no change after 30 min. 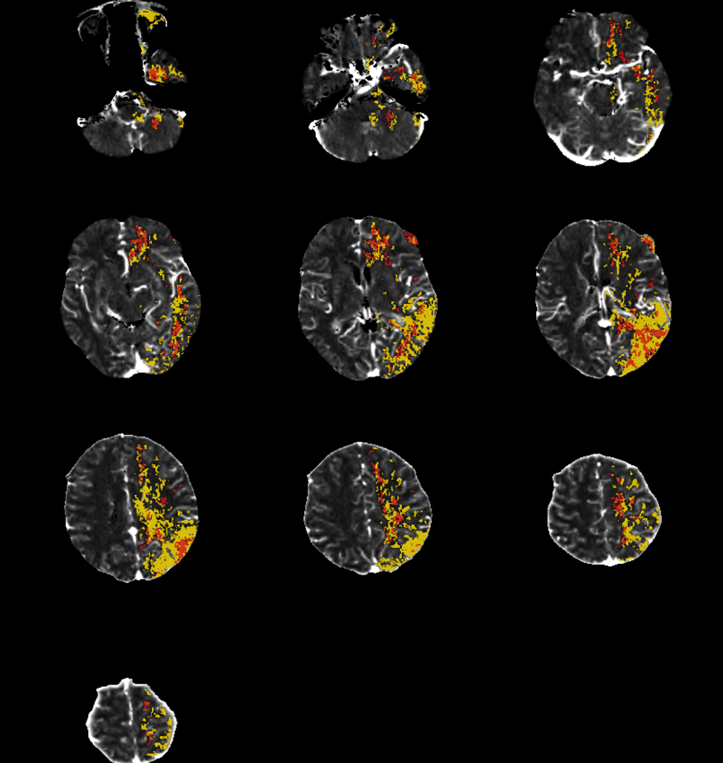 Very reasonable to give up but we decided to see if an XT-27 could go beyond the thrombus. Unfortunately we did not have a 160 cm Marksman at the time which would have done the same for sure. The XT makes it just beyond the clot. Next comes a 4×15 Solitaire. In my opinion it is the best thrombectomy device for distal access on US market. 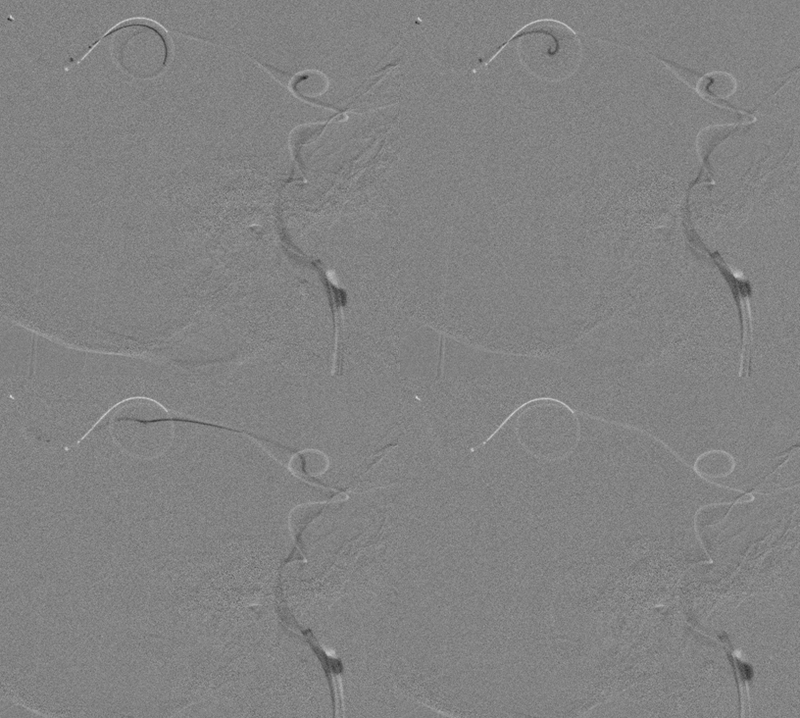 The others, even if specked at 3 mm, are much stiffer. As you can see, the Solitaire is deployed just fine. Here are snapshots of the “pull” — removing the Solitaire with hopefully the clot attached to it. As you can see, the entire system is straightened, including the loops in the Sylvian fissure. This is the most important image of the case — a pull like this is almost guaranteed to produce small vessel avulsions and Sylvian fissure hemorrhage. If the patient were on confirmed anticoagulation or dual antiplatelets or still had tPA on board i would not do it. He was not and the IA doses are low in my opinion. So we took the risk. Angio after clot removal (it was mixed yellow-red thrombus). Notice diminished parenchymal blush in the reopened brain, the majority of which i think is already dead. CT shows what was predicted — a mix of contrast and blood in the Sylvian fissure. Notice that the extravasation is greatest in the area where the MCA loop was straightened out. 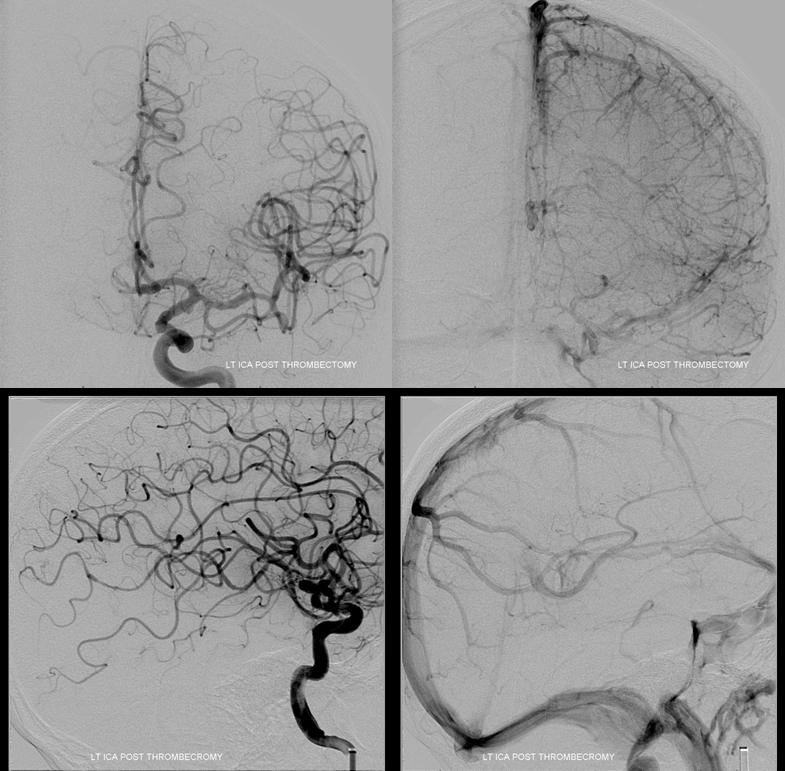 It is not a “hemorrhagic conversion” of revascularized posterior temporal and angular regions, but subarachnoid hemorrhage due to avulsion of small vessels off the MCA during the Solitaire pull. This is seen quite often and does not qualify as a significant event unless the NIHSS goes up more than 4 points. In fact, his went down 2. Most of what is seen in the fissure is hyperdense contrast. 24 hours later, it is clearing well. There is an evolving stroke in the angular region. Exam improved over the next 3 days, with mild residual receptive aphasia and a quadrantanopsia. Certainly there is room for doing nothing here, or doing IA only, or whatever. 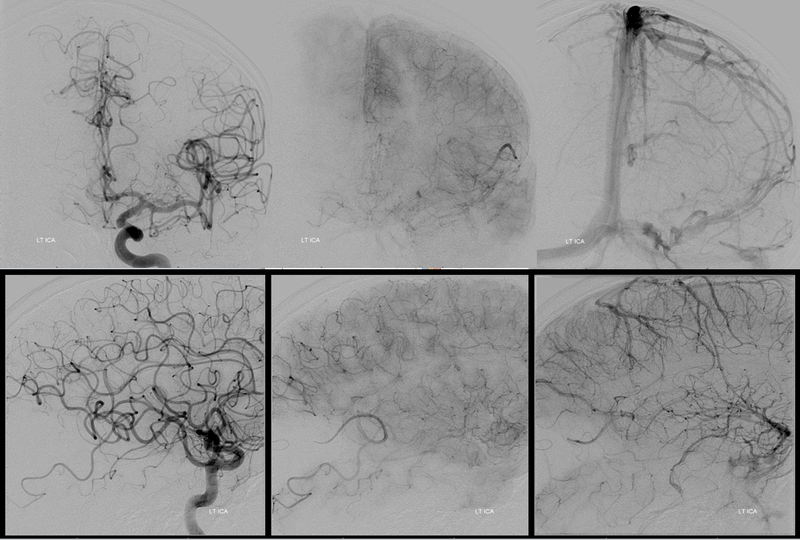 The takeaway point is that distal mechanical thrombectomy is quite feasible, particularly with the smaller Solitaire devices (in United States, other places have other choices), but does come with a real and even predictable consequence of subarachnoid extravasation. It is typically tolerated extremely well, but factors such as presence of therapeutic level anticoagulation or systemic tPA can make hemorrhage less forgiving. The choice is yours.